What makes you think I like Begonias? 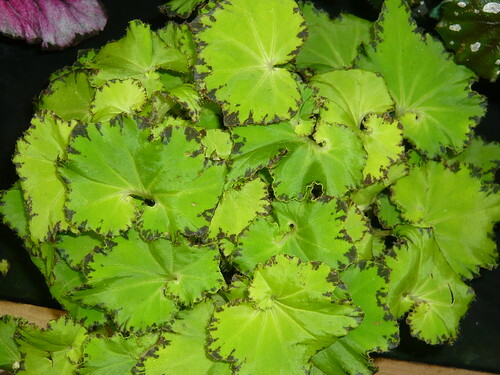 This Begonia Rex is grown for its strongly coloured foliage and the spikes of light blue/white flowers are inconsequential. They can be propagated by leaf cutting, rooting in water or perlite. As house plants begonias like high humidity. There are many interesting Hybrid Begonias with red leaves and they do look a bit different when massed in the garden or grown indoors as a house plant. 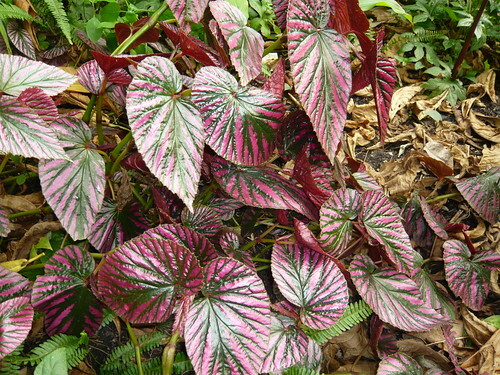 Even red leaved plants will photosynthesize. Pigments such as the red anthocyanins will mask the green chlorophyll pigments of some plants. Usually it is is the chlorophyll which is the stronger colour hence the green which predominates but not in these cases. Later in the season chlorophyll breaks down which then allows the other colours to show through. This provides one reason for the Autumn colours in many trees and shrubs. 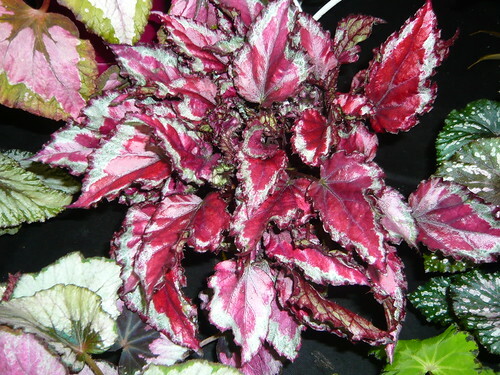 Plum purple leaved Begonia Rex. Buying hints – Plants around 6″ tall are usually good value and inexpensive. Chose plants with well shaped leaves and colouring. 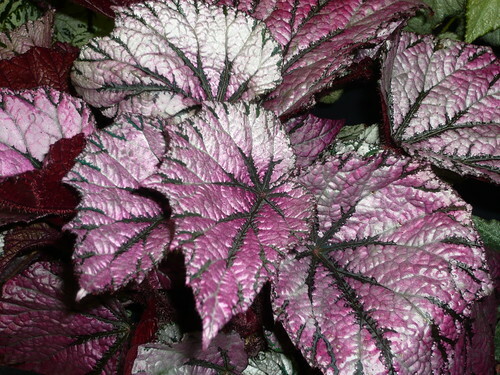 Caring hints – Foliage begonias like subdued or filtered lighting even doing well in artificial lighting. Keep at 60 degrees centigrade. Watering and Feeding – Only water when the soil feels dry, do not mist the leaves, avoid excess water that will cause leaf rot or grey mould.